Being one of the most beautiful countries in the world, Italy is an ideal place for hotel barging. Its beautiful canals and rivers roll through diverse landscapes, from picturesque lagoon islands with their colorful houses, to wild beach dunes and pine woods with an abundance of birdlife. These waterways were once used for trade by Romans and early Mediterranean settlers before them and are ideal for gaining knowledge about many cultures, including Roman, Etruscan, Istrian, Byzantine and of course Renaissance, that have influenced the arts, architecture and history of the region over many centuries. If you want to explore the beautiful landscapes and get an insight into the ancient culture of Italy, an Italy Cruise is the perfect choice. Aboard an Italy Cruise, you can enjoy exploring Northern Italy in a royal and relaxing way. Venice is the highlight of any Italian cruise. The lagoon surrounding Venice, the Venice Lido beach, Hemingway’s influence and the fabulous waterside Villas; all add to the attractions of Venice. Delicious seafood, local culinary specialties, fine wines and attentive service complete the picture of this fairytale adventure. You can cruise between the romance and architecture of Venice, to the captivating lakeside setting of the Renaissance city of Mantua. Mantua is in central northern Italy, and has been a hub of art, culture and music for centuries. The route inland takes you along the River Po and the Bianco Canal through the Po Valley. European Barging offers different cruise options and you can choose according to your interest and convenience. 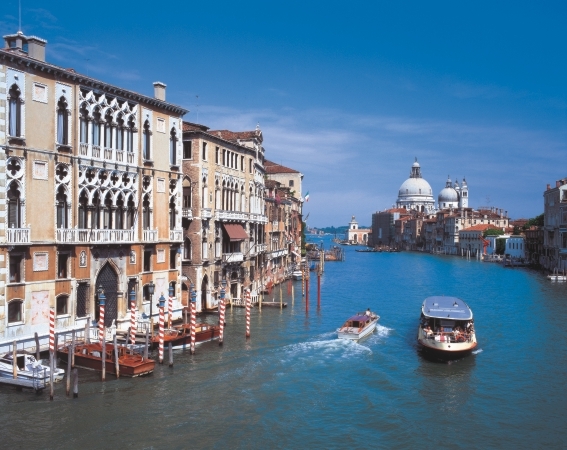 Our Venice cruise offers barges overnight with free time for you to explore the city. It is very enjoyable and affordable at great hotel rates. The Michelangelo offers a winter cruise in the Venice lagoon and often cruises at the Carnival. Like Venice, Michelangelo is also quite affordable as it offers reasonable hotel rates including the meals. We also offer casual bike and barge cruises on the 34 passenger Ave Maria and 20 passenger Vita Pugna for active people, cruising between Venice and Mantova. Such types of cruises are a good value and appeal to people who love adventure and exploration. Cycle enthusiasts can mingle their passion for cycling with sailing aboard our fantastic cruises. La Bella Vita is a 20 passenger luxury barge offering fine dining, open bar, bicycles for cycling and all excursions included in the rate. So, get ready to explore enchanting Italy aboard our marvelous Italy cruises. Here you get best possible enjoyment, comfort and convenience at reasonable rates. We keep in mind the interests and tendencies of different people and design our programs accordingly. Get aboard our cruises and have the most enjoyable and unforgettable experience of your life! week detail of where the vessel cruises or the exact itinerary. Included in the price: 6 nights cruise, all meals, wine with lunch and dinner, open bar, all excursions, and bike.